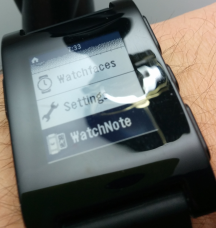 Flip Bits Not Burgers: WatchNote - Pebble Smartwatch - Evernote integrated! 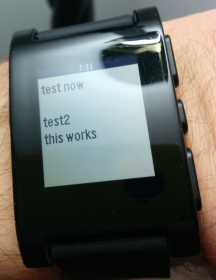 WatchNote - Pebble Smartwatch - Evernote integrated! I finally feel like it was worth buying a Pebble, with recent support for Amazon MP3 music (where all my music lives), and now, more importantly, an iPhone and Android app that had somehow escaped my attention since August: WatchNote. One of the biggest reasons I carry a big-screened smartphone (still packing both my Droid Razr MAXX and now my new Google Nexus 5) is for notes! 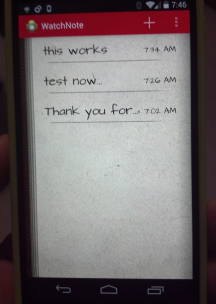 Grocery notes, work notes, to-do-lists, miscellaneous notes, notes, notes! Keeping Evernote live up on the phone screen is a bit annoying however, not to mention the frequent required sacrifice of a hand while shopping, and the "here's my phone steal it" aspect of things, or "I set my phone down to pick something up where did it go" anxiety. 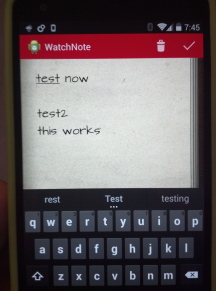 I wish I could select existing notes in Evernote to sync to WatchNote. 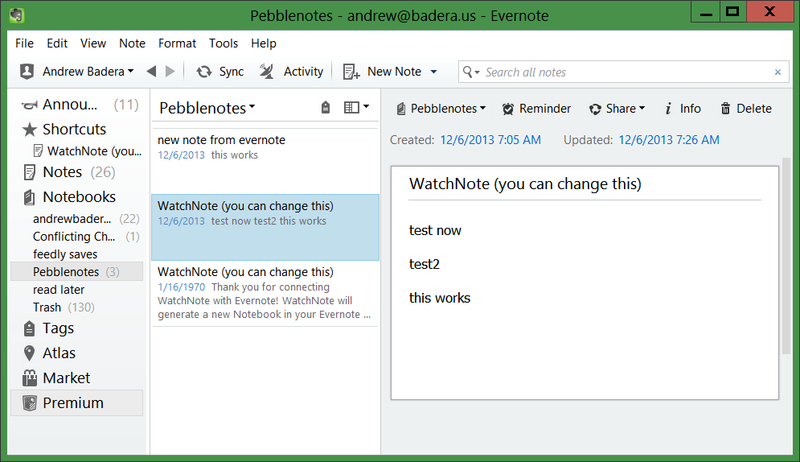 For now, I'll just copy old Evernotes into the new Evernotes in the Pebblenotes folder for WatchNote. The synchronization when notes get updated is a little clunky, as it has to go between Evernote client, Evernote server, WatchNote app, Pebble app, but it works. (Again, only a LITTLE Rube Goldberg here.) I wish the WatchNote app had a manual sync/refresh function like Evernote itself does, but I can't seem to find one presently. 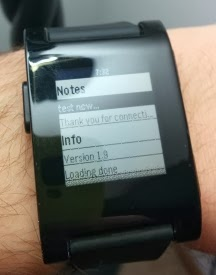 I have been shutting the app off and restarting it to force a sync, which lead me to realize (perhaps it should have been obvious) WatchNote needs to be actively running in order for the Pebble app to retrieve/update notes. All in all very well worth a coupla bucks! 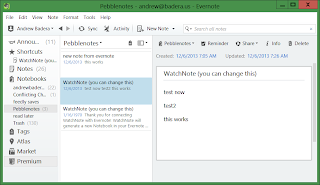 I highly recommend it to all Pebble owners, ESPECIALLY Evernote users - but it's standalone note client would also suffice for most basic note needs.